I needed to find a cute little pink something for the 5th birthday of my friends wonderful little girl. I know that she likes purses and bags (who doesn’t??) 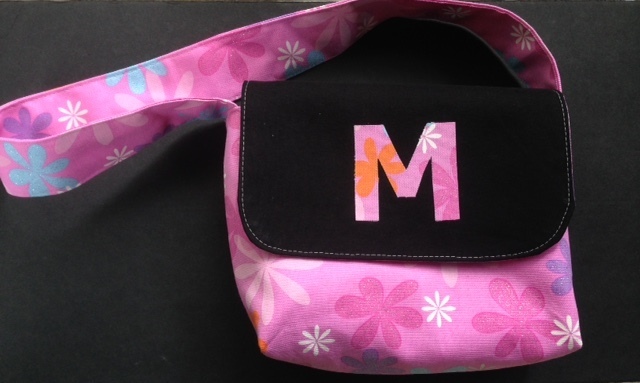 so I decided to make her a monogram kid messenger bag. I had used this great kid sized messenger bag tutorial from Merriment Design to make my son a library bag. He was older and taller so I adjusted the measurements for him, but used the same basic design and instructions. For my friends daughter, who is much smaller I kept the same measurements as the tutorial and instead adding something inside the flap I decided to applique her initial on the front of the bag using some Heat n Bond. I raided my stash of fabric from the thrift store and found a great flower and glitter fabric. I think she will love it! I decided to use the Merriment Design tutorial because I had used this tutorial before, but I also found these other free tutorials online that I hope to try in the future. So many tutorials, so little time :-).